About DMAT Consulting KG - D.M.A.T. The name DMAT Consulting stands for Disaster Management Advice and Training (Disaster Management, Consulting and Training). In 2006, the D.M.A.T. E.U. was founded as a one-person company. 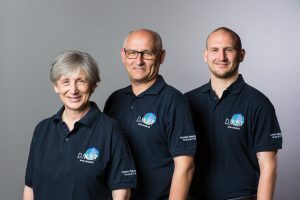 The strong interest and need for research, innovation and training in crisis and disaster management in 2010 brought the decision to reorganise the company into today’s D.M.A.T. Consulting KG. EU research projects (FP 7 / HORIZON 2020 around Space, Security) to develop the equipment used by the auxiliary staff, in the field of secure and reliable information gathering and evaluation. Preparedness and Prevention Projects of the EU Civil Protection Mechanism (Preparedness & Prevention). DMAT Consulting KG is a member of ARGE PRO ETHIK and the Global Compact Network Austria. The managing director is Mrs. Mag. Monika Hirschmugl-Fuchs. Shareholder manager and expert in disaster management is Mag. Alois A. Hirschmugl. Since September 2014, our team Sebastian Hirschmugl has strengthened as office manager and project assistant. Read more about our members and their expertise Dr. Alois Hirschmugl, Mag. Monika Hirschmugl-Fuchs and Sebastian Hirschmugl.